(APN) ATLANTA — None of the three bills sought by the Georgia Water Coalition came up for committee votes prior to Crossover Day during this year of the 2017-2018 Legislative Session. 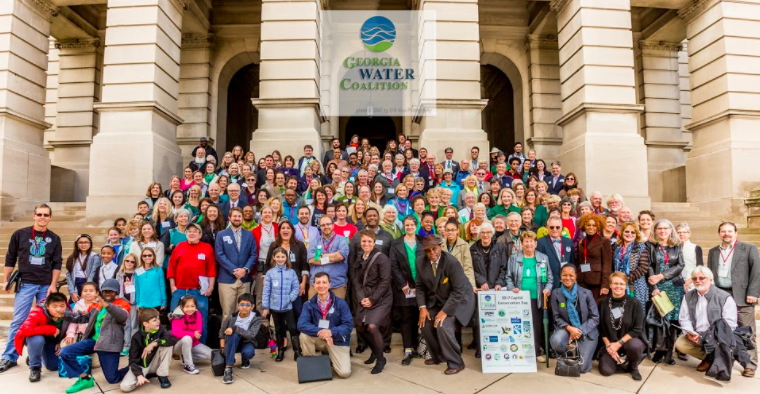 On Wednesday, February 15, 2017, the annual Capital Conservation Day, the Georgia Water Coalition lobbied for three bills that would help protect the environment from toxic coal ash leaks that pollute the waterways and can cause health problems like cancer. The three bills, which could still come up in 2018, are SB 165, a coal ash liability bill; HB 387, a coal ash pond dewatering bill; and HB 388, a landfill bill. Coal ash is what is left behind when coal is burned by utilities to generate electricity. It contains heavy metals like arsenic, lead, mercury, chromium, and selenium that are harmful to human health and the environment. Coal ash is stored in municipal solid waste landfills and coal ash ponds that often have no liners to prevent the chemicals from seeping into our water. Georgia Power has 86 million tons of toxic coal ash, and about 90 percent is still in pits that lack liners beneath the ash to prevent groundwater contamination. So it should be no big surprise that at six of their eleven sites, ground water contamination has been discovered. Georgia Power plans to discharge about five billion gallons of contaminated coal ash wastewater into Georgia’s waterways. There is currently no requirement to remove dangerous contaminants from the wastewater before releasing it into our streams and rivers. The United States produces about 130 million tons of coal ash each year and Georgia Power produces about 6.1 million tons. State Sen. William Ligon (R-Brunswick) introduced SB 165, which discourages companies from dumping their coal ash in Georgia and from not taking responsibility for leakage. Sen. Ligon’s bill provides that if you are the producer of coal ash and you store that ash on the property of a third party, you will remain jointly liable for any damage from a release. It also provides that out-of-state producers of coal ash cannot deposit coal ash in Georgia unless they own at least 100 million dollars in assets in the state or have posted a surety bond in an amount to cover any liability from leakage of coal ash into the water and environment. “The idea of the bill is to make companies coming in from other states to think twice before dumping their coal ash on us in Georgia. 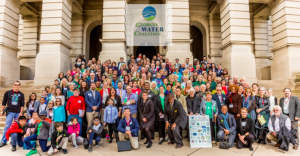 You will remain responsible for your coal ash if it is released onto someone else’s property,” Sen. Ligon told the Water Coalition during their gathering. State Rep. Jeff Jones (R-St. Simons) introduced two bills, HB 387 and 388. HB 387 requires companies to convert from using wet coal ash ponds, to using dry storage of ash, by a process called dewatering or separating the water from the coal ash. It requires utilities to submit a major modification to the National Pollutant Discharge Elimination System (NPDE) water discharge permit; and to test and treat for heavy metals before releasing coal ash wastewater into Georgia waterways. “The EPA decided that coal ash can no longer be stored in wet ponds because of problems with leaking and seeping causing groundwater contamination. Utilities have to dry the coal ash by pumping the water out, then test and treat the water before putting it back into the streams and rivers. The dry coal ash is then stored someplace else,” Jen Hilburn, Executive Director, Altamaha Riverkeeper told Atlanta Progressive News. HB 388 deals with coal ash disposal in landfills. It increases monitoring of groundwater wells, and makes sure municipal and commercial landfill operators and owners are prepared to safely handle coal ash waste. Coal ash is more hazardous than the typical solid waste in municipal landfills. If there is an increase in the amount of coal ash that contains heavy metals, carcinogenic materials, and potentially radioactive materials into a landfill, then the landfill owner and operator must meet new standards. “Rep. Jones’s bill requires public notice of when coal ash is coming into a municipal landfill and a coal ash management plan to be filed with the Department of Natural Resources before any coal ash can be received at a facility,” Megan Desrosiers, Chief Executive Officer, One Hundred Miles, explained at the Georgia Water Coalition meeting. It requires that local governments and communities be notified if there is an accidental coal ash release. It codifies a guidance document of the Georgia Environmental Protection Division into law to help coal ash site owners do their jobs. The Southern Environmental Law Center (SELC) is in federal and state courts to make utilities clean up their unlined, leaking coals ash waste sites and protect people’s health and the water. They have legal actions and lawsuits in several states including North Carolina, South Carolina, Virginia, and Tennessee. It is only a matter of time until we see lawsuits in Georgia from decades of pollution from coal ash ponds.